To me, summer is all about the barbecues! I’m not one to barbecue in the winter months so it’s a special time of year when I can get outside in the beautiful weather and grill my family a delicious meal. With Canada’s 150th birthday coming up in July, I bet there will be a lot of celebrations with barbecues involved. I know my family is super excited and starting to get ready for the party to begin! Bridget is ready with her party gear and can’t wait for the fun to start. I haven’t pinpointed yet how we will celebrate this momentous occasion. I know it will involve good food though like any proper Canadian party should! We just purchased a “new” camper so I’m thinking we may want to spend a few days enjoying nature on a local campground. And yes, I’m planning already about what food I want to bring with us! It needs to be something special because it’s not every day that our country celebrates its 150th birthday. 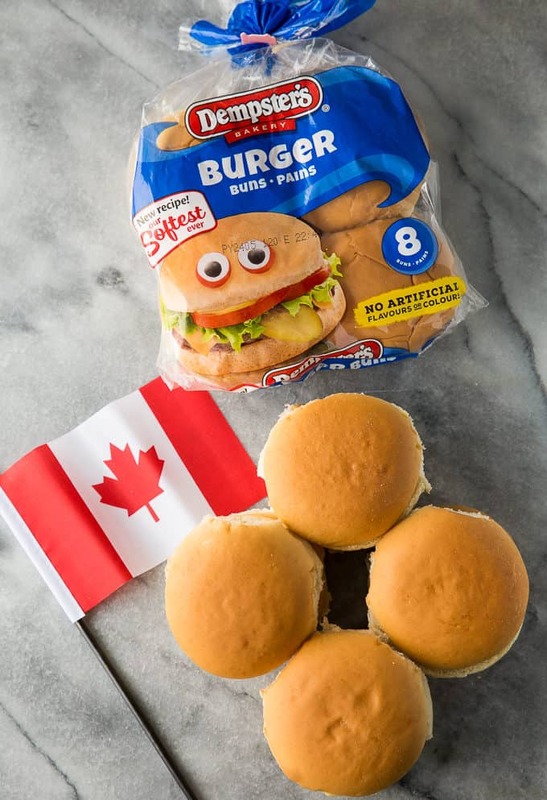 For our barbecues, we rely on the essentials like Dempster’s Burger Buns and Hot Dog Buns. Everyone loves their burgers and ‘dogs so they are a staple at all our family barbecues. I know I can count on Dempster’s to deliver a high quality bun that is the softest ever, fresh and oh so tasty. Some may say the meat makes the burger, but I’m also thinking the bun plays a big role, too. Because this is no ordinary barbecue, I wanted to create a not-so-ordinary burger recipe. It needed to be memorable, yet simple to make. Of course, it had to taste delicious. 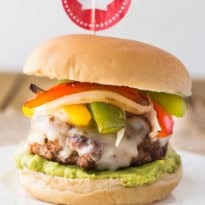 I made my family Chicken Fajita Burgers and they fit all my criteria perfectly! 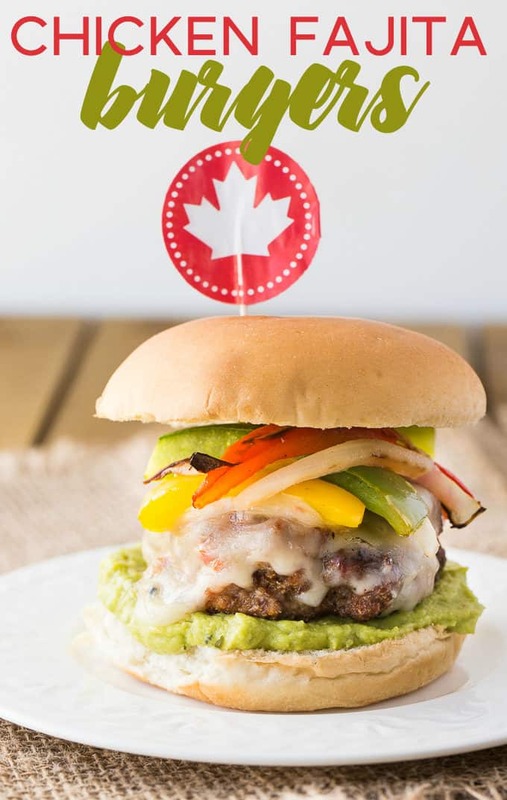 Friends, you are going to love this recipe and want to make it for your own Canada Day celebration. Let’s go on a #Breadventure, shall we? 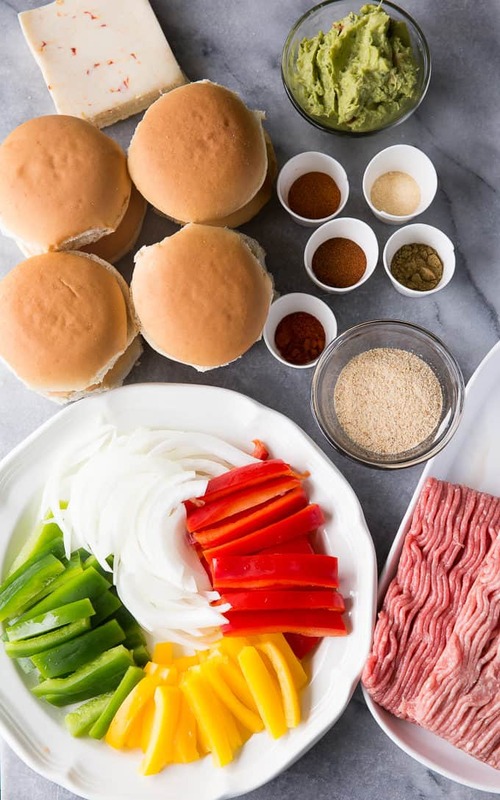 You’ll need peppers, onions, spices, ground chicken and a package of Dempster’s Burger Buns. This recipe makes 8 burgers, but can easily be doubled or tripled to feed a larger crowd. I also made my own fajita spice mix from spices in my pantry. I think it adds to the “homemade” feel of the recipe. Everything in this recipe, including the veggies, is cooked on the barbecue. 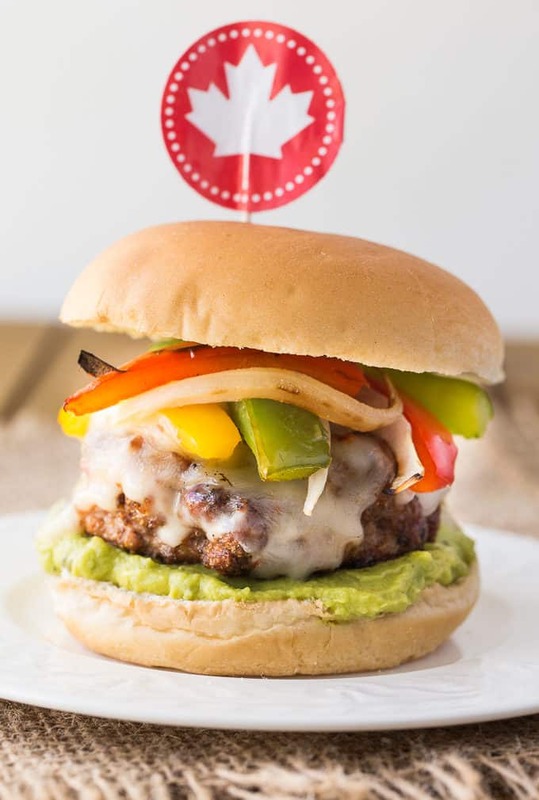 The burgers are simply lean ground chicken, breadcrumbs and your fajita spice mix. The veggies go into a disposable aluminum barbecue tray or a veggie grill basket if you have one. I didn’t put them right on the grill because I knew they’d burn quickly and I wanted everything to cook at the same time and temperature. Dinner will be ready to serve in about 18 to 20 minutes. I recommend using a meat thermometer to check if your burgers are cooked to the right temperature. I’d rather not cut them open to look at the doneness and I think using a thermometer is your best bet. I add the cheese to the burgers at the very end. It won’t take long to melt on your burgers – maybe a minute or two! The next step is the fun part and something the kids can help with. 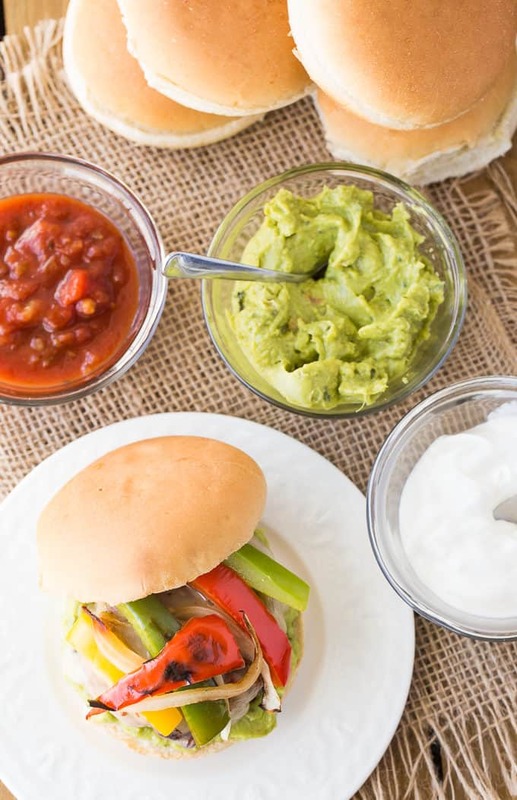 Grab your Dempster’s Hamburger Buns and spread a layer of guacamole on the bottom half. 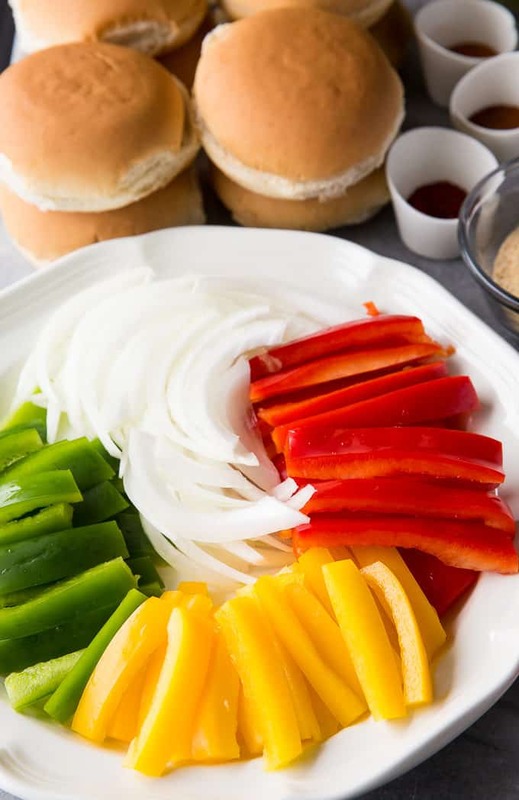 Top with a chicken burger, grilled peppers and onions and finish off with your top bun. I also added two dipping sauces just for kicks – salsa and sour cream. The sour cream cools down the heat of the burger and the salsa adds an extra spicy kick. The burger is hot, juicy and full of flavour. I love all the textures – it’s a party in your mouth! You have the soft, fresh Dempster’s Hamburger Bun (the softest ever!) keeping it all together, a spicy chicken burger with melted cheese and soft, grilled peppers and onions. There’s a whole lot of YUM going on here. I loved how easy it was to make. Homemade doesn’t have to be hard. There isn’t a ton of prep work beyond slicing your veggies and mixing the meat. Plus, making your own burgers with your damp, clean hands can be somewhat therapeutic. If you are looking for a recipe jam-packed with flavour, this is one to try. 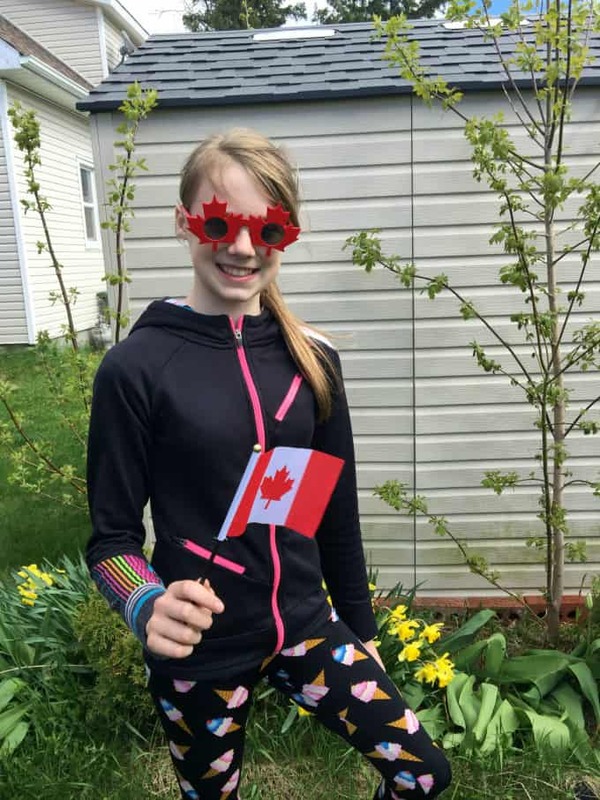 It’s perfect for summer, including Canada Day celebrations, and I know your family will enjoy it as much as mine did. 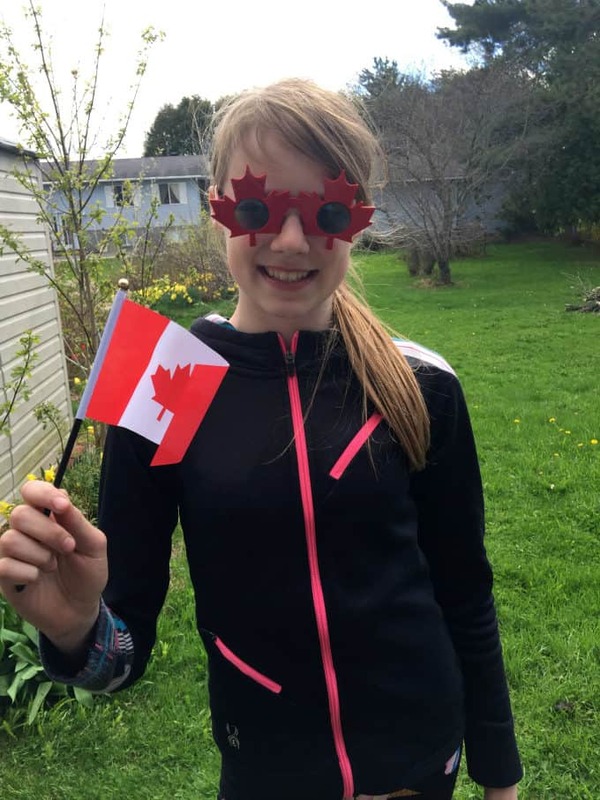 Happy Canada Day everyone! Follow #Dempsterscelebrates150 on social media to see more amazing recipes for the upcoming holiday. I’d love to hear what’s on your barbecue menu this summer? A party of flavours in your mouth! 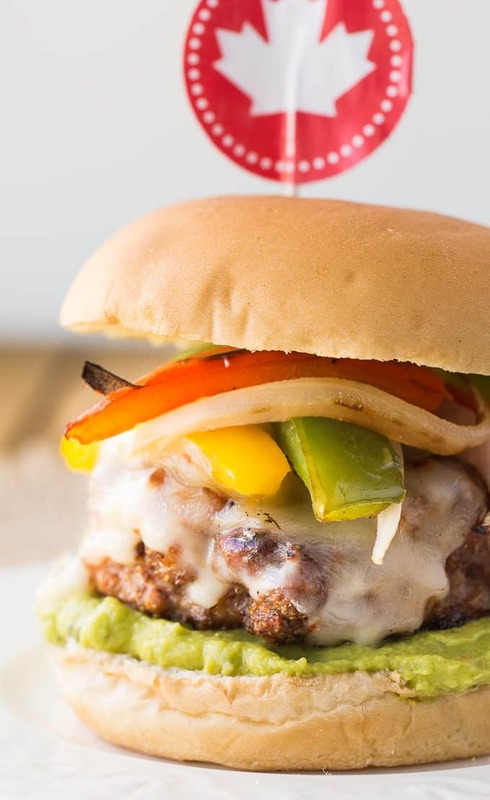 Fire up the grill and make these spicy burgers this summer. In a large bowl, add ground chicken, chili powder, cumin, paprika, cayenne pepper, garlic powder and breadcrumbs. Using damp, clean hands, combine ingredients together. Shape mixture into eight patties. Preheat barbecue to medium high heat. Place peppers and onions in a disposable aluminum barbecue tray and cover with aluminum foil. 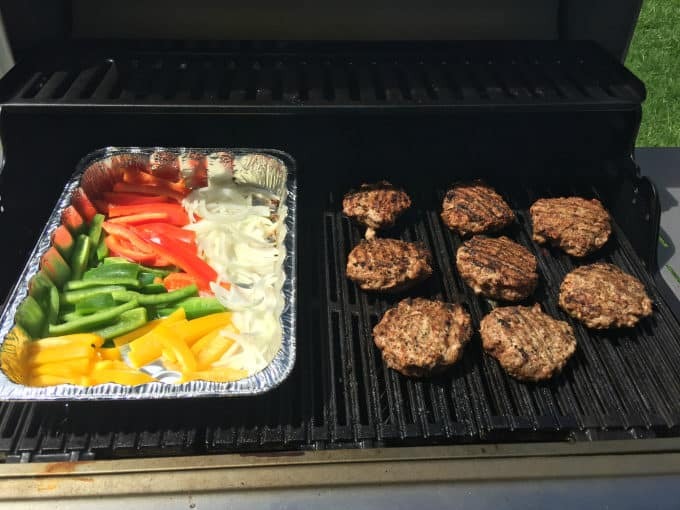 Once heated, place burgers and vegetables on the grill. Cook burgers for 8 minutes and then flip over. Remove aluminum foil covering from vegetables and continue to cook. 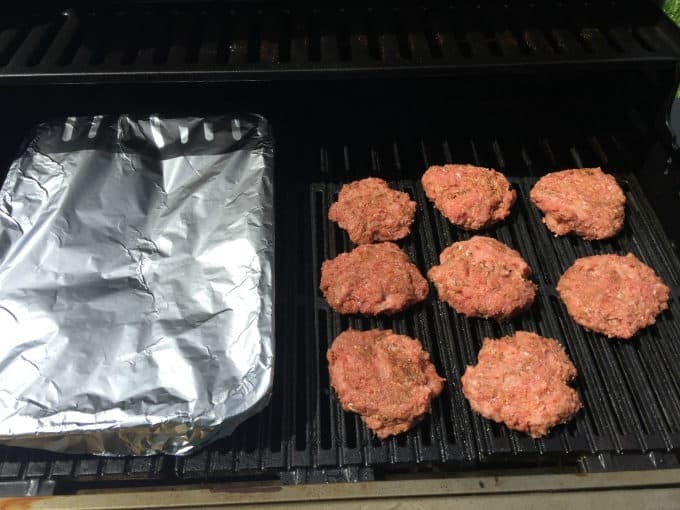 Cook burgers and vegetables an additional 8 to 10 minutes or until a meat thermometer reaches 165F on the burgers. Add cheese during last minute of cooking time to melt on burgers. 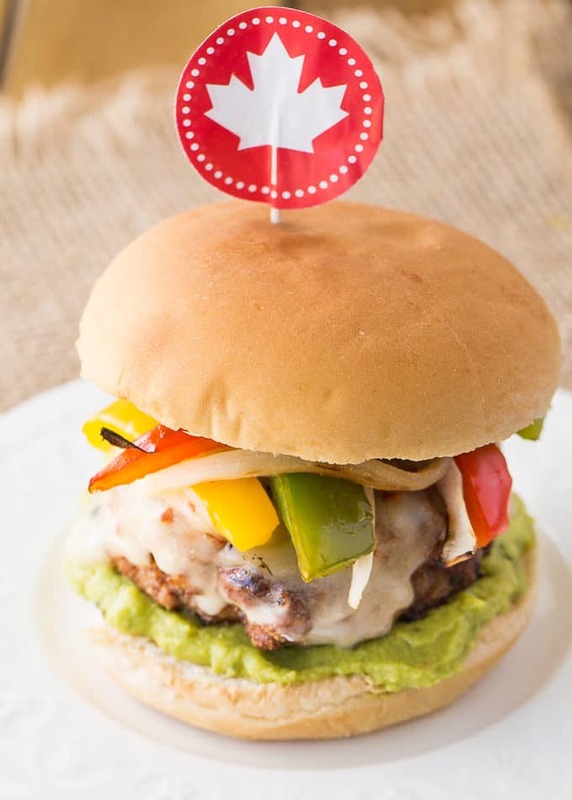 Spread 2 to 3 tablespoonfuls of guacamole on the bottom of a Dempster’s Hamburger Bun. Top with chicken burger, veggies and bun. Serve hot with salsa and sour cream for dipping. I love to BBQ KABOBS! Turkey burger are on the BBQ menu. Like to do spicey sausages on a bun. Steaks are on the BBQ menu this summer. Oooh yum! I need to try these! Thanks for sharing with Merry Monday this week! I’m featuring your burger recipe at our upcoming party. Hi! I’m one of the co-hosts from the Welcome Home Wednesday Link Up. These burgers sounds incredible. I’m wishing I had seen this recipe before now because they would be delicious for the 4th! I’ll make them soon though. Thank you for sharing!